The Bluetooth Chat example shows how to use the Qt Bluetooth API to communicate with another application on a remote device using Bluetooth. 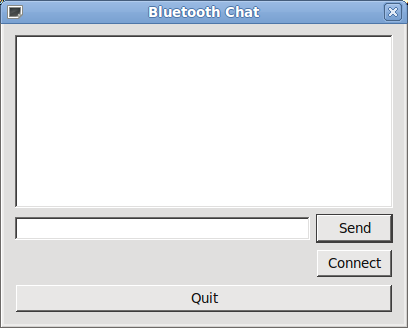 The Bluetooth Chat example implements a simple chat program between multiple parties. The application always acts as both a server and a client eliminating the need to determine who should connect to whom. The first thing the chat server needs to do is create an instance of QRfcommServer to listen for incoming Bluetooth connections. Our clientConnected() slot will be called whenever a new connection is created. The chat server is only useful if others know that it is there. To enable other devices to discover it, a record describing the service needs to be published in the systems SDP (Service Discovery Protocol) database. The QBluetoothServiceInfo class encapsulates a service record. We will publish a service record that contains some textural descriptions of the services, a UUID that uniquely identifies the service, the discoverability attribute, and connection parameters. The textural description of the service is stored in the ServiceName, ServiceDescription, and ServiceProvider attributes. Bluetooth uses UUIDs as unique identifiers. The chat service uses a randomly generated UUID. A Bluetooth service is only discoverable if it is in the PublicBrowseGroup. The ProtocolDescriptorList attribute is used to publish the connection parameters that the remote device requires to connect to our service. Here we specify that the Rfcomm protocol is used and set the port number to the port that our rfcommServer instance is listening to. Finally, we register the service record with the system. As mentioned earlier, incoming connections are handled in the clientConnected() slot where pending connections are connected to the readyRead() and disconnected() signals. The signals notify others that a new client has connected. The readSocket() slot is called whenever data is ready to be read from a client socket. The slot reads individual lines from the socket, converts them from UTF-8, and emits the messageReceived() signal. The clientDisconnected() slot is called whenever a client disconnects from the service. The slot emits a signal to notify others that a client has disconnected, and deletes the socket. The sendMessage() slot is used to send a message to all connected clients. The message is converted into UTF-8 and appended with a newline before being sent to all clients. When the chat server is stopped the service record is removed from the system SDP database, all connected client sockets are deleted, and the QRfcommServer instance is deleted. The client creates a new QBluetoothSocket and connects to the remote service described by the remoteService parameter. Slots are connected to the sockets readyRead(), connected() and disconnected() signals. On successful socket connection we emit a signal to notify others. Similarly to the chat server, the readSocket() slot is called when data is available from the socket. Lines are read individually and converted from UTF-8. The messageReceived() signal is emitted. The sendMessage() slot is used to send a message to the remote device. The message is converted to UTF-8 and a newline is appended. To disconnect from the remote chat service, the QBluetoothSocket instance is deleted. We create an instance of the ChatServer and respond to its clientConnected(), clientDiconnected(), and messageReceived() signals. In response to the clientConnected() and clientDisconnected() signals of the ChatServer, we display the typical "X has joined chat." and "Y has left." messages in the chat session. Incoming messages from clients connected to the ChatServer are handled in the showMessage() slot. The message text tagged with the remote device name is displayed in the chat session. In response to the connect button being clicked, the application starts service discovery and presents a list of discovered chat services on remote devices. A ChatClient for the service is selected by the user. const QBluetoothAddress adapter = localAdapters.isEmpty() ? In reponse to the connected() signals from ChatClient, we display the a "Joined chat with X." message in the chat session. Messages are sent to all remote devices via the ChatServer and ChatClient instances by emitting the sendMessage() signal. We need to clean up ChatClient instances when the remote device forces a disconnect.